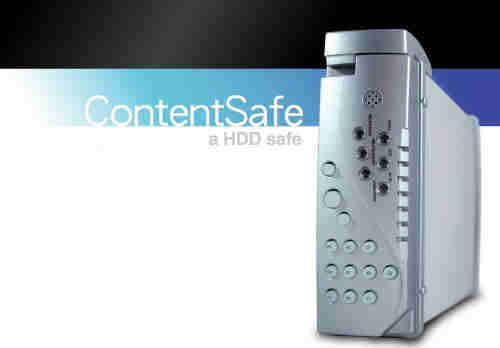 May, 2005 -- Transcom has started to shipped out samples of the newest product concerns content storage. -This CIntentSafe MPG061-25 uses a fingerprint reader to prevent unauthorized user from access the content in the disks that has been protected by the unit. A disk is protected by the unit when a new disk is placed in the unit and going through the format procedure. The unit once connected to the host, the LEDs on the unit will be lit to indicated that the user has to swipe the finger over the fingerprint reader. A failed fingerprint check will result in not being able to see the unit on the host. When the finger print is accepted, the USB 2 interface then starts to function and allow the host to see the unit. Any attempt to remove the disk from the unit and to be placed the disk in other external disk enclosure or other system internally will see a blank disk, hence the content is protected. The unit will protected unauthorized access to the content that is only for people intended. The unit allows the owner to assigned multiple users or multiple fingerprints just for convenience sake. -The Digital Safe MPG061-35 is a digital safe that utilizes on-unit keypad to prevent unauthorized access to the system. The system is an enclosure that houses 3.5" hard disk drive to be used as an external storage device. The content within the product can only be accessible if a valid pass code has been entered. While in the real safe the owner has no saying what the key will be, the digital safe allows a user to register a pass code of own choosing. The unit can take an alternate pass code so that more than one user can access the disk protected by the device.